Naming Contest Winners: Meet manta rays Sylvia and Eugenie! The Aquarium’s Marine Conservation Action Fund (MCAF) recently provided funding so researchers with the Manta Trust could tag manta rays in the Pacific Ocean. The researchers invited Aquarium fans to help them name two of those tagged rays. Thanks to everyone who submitted names on our Facebook page. We have a winner! Find out more about the names, the winners and the program in these statements from the Aquarium’s President and CEO Nigella Hillgarth, PhD, and our friends at the Manta Trust. We received many great entries for the manta ray naming contest and I am excited to report that the Aquarium’s Conservation team and the Manta Trust have chosen the winners. The two manta rays, satellite tagged by the Manta Trust and with support from the Aquarium’s Marine Conservation Action Fund will be named Sylvia and Eugenie for world-renowned marine scientists Sylvia Earle, Ph.D., and Eugenie Clark, Ph.D. Congratulations to the winner, Christine Archer, and thanks to all for your submissions! We were ecstatic to receive so many naming suggestions from enthusiastic New England Aquarium fans, and we're happy to report that the final names for our two satellite-tagged manta rays have been selected. Sylvia Earle and Eugenie Clark are giants in the marine science and conservation fields, so it seems fitting that they should have two literal giants named after them and collecting valuable data that is directly supporting science and conservation. Thanks to the support of the Aquarium's Marine Conservation Action Fund, Sylvia and Eugenie are currently swimming around the Pacific Ocean after being tagged at Mexico's Revillagigedo Islands. 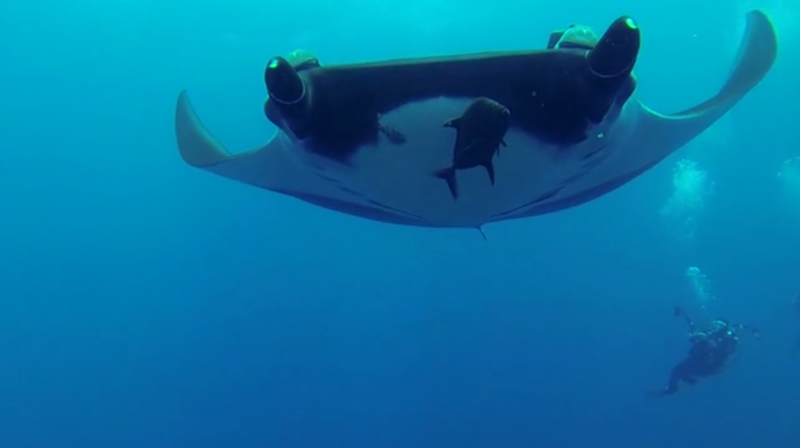 Manta ray swims with researchers. A screen grab from a moment in this underwater video. They're sporting the latest in satellite tag technology and are helping us understand the movements, behavior and habitat use of oceanic manta rays in the Tropical Eastern Pacific. This information will help us understand how mantas are affected by fisheries, and how managers can reduce bycatch through time-area closures or gear restrictions. In November these tags will automatically detach from our intrepid ocean explorers (the mantas, not the scientists, of course!) and transmit details of their six-month journey to us via satellite. Shortly thereafter you'll be able to explore the satellite tracks of these mantas on the DataMares website, a data sharing initiative of our partner organization the Gulf of California Marine Program. 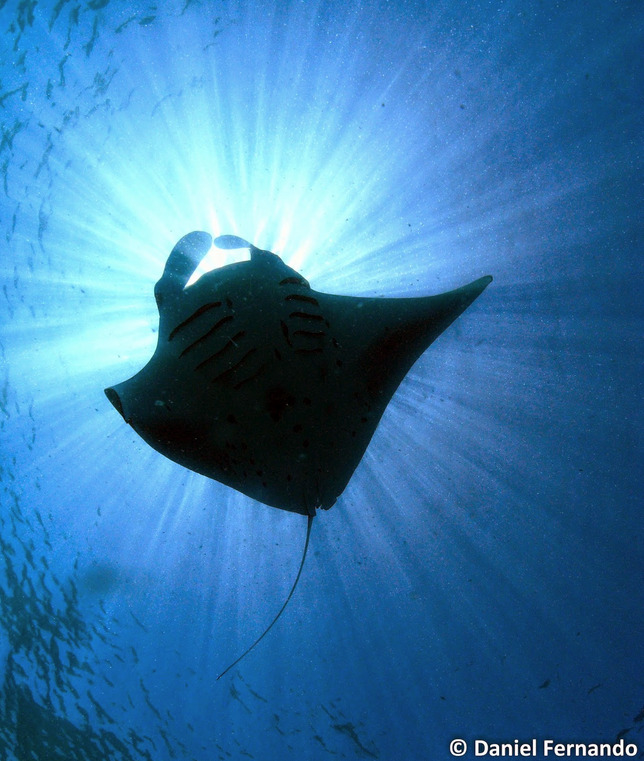 We are excited to be partnering with the Aquarium on a number of manta conservation initiatives around the world, and are grateful for their continued support. Discover other projects supported by the Aquarium's MCAF program, all supporting grassroots research around the world to study and protect animals and habitats of our blue planet!